Tidal X: A 'Concert'? Or a Meeting of Illuminati Minds? When I first heard about Jay Z’s Tidal X concert, I initially had no intentions of going. There was no way I was putting on clothes and leaving my apartment when I could just stream the thing from my bed. And, having already cancelled my Tidal subscription months ago, I had no stake in this operation. I did not believe in this dream. I’d long given up on supporting all the mega-stars who claimed ownership in Jay Z’s streaming service during the Greatest Press Conference of All Time. Then I saw the lineup. Beyoncé. Jay Z. Nicki Minaj. Usher. Prince??? These weren’t just Tidal partners joining together for a one-night extravaganza. This was Jay Z harvesting something much bigger, right under our eyes. The Tidal concert was at once billed as a showcase of emerging and established artists and as a benefit concert with proceeds going to—wait for it—the New World Foundation. Really, this was a Tidal promotion vehicle (lots of free shirts included). But beneath the veil, it was much more. It was, in fact, an elaborate front for the secret biannual meeting of illuminati members called IT WE. That was my theory. I suspected that the show would serve as a recruitment center for future members. I also had an inkling that Jay Z would be sending special messages through Barclays. Was it the weirdest? Or, in fact—the most powerful? The jig was up before the main acts even hit the stage, when the French group Indochine performed a song that included these words: something-something “SO DARK,” something-something “COME ON.” Do I even have to explain this? COME ON OVER TO THE (SO) DARK SIDE. There was my first clue. Additional proof materialized throughout the night. Uh, was I the only one who noticed this obvious Circle of Light? I could hardly believe my eyes when Damian Marley came out for “Welcome to Jamrock” (still a banger) and was announced as the newest Tidal partner. Maybe also the latest member of a secret society that only asks for trust??? Was no one else seeing this? I looked around and noted everyone in a daze. Clueless cyborgs. Some strange force was possibly sensing that I was getting closer to the truth. Minutes later, mid-level Illuminati member T.I. strolled out in all black to “Ain’t About the Money,” along with Young Dro, who I hadn’t seen in years. This was another clear sign of an important night. Dro, I believe, was there to sign contracts to make his membership official. And here’s where it gets creepy. 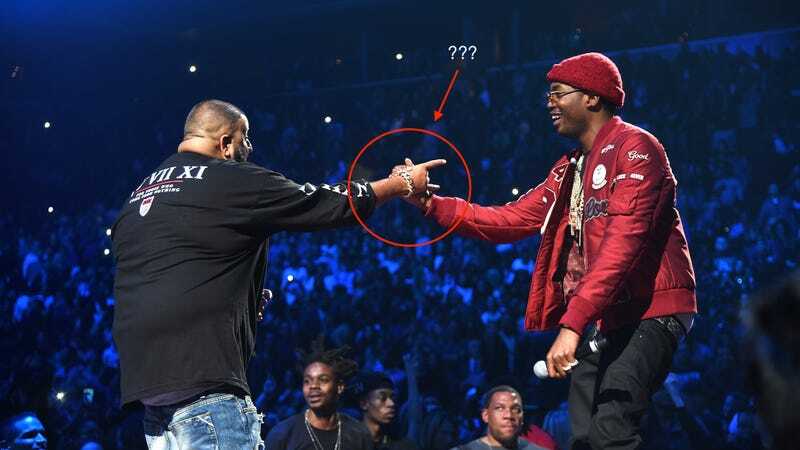 Meek Mill hurried out and screamed his boisterous single, “Dreams and Nightmares Intro,” and then, up from the smoke, emerged RICK ROSS for “I’m A Boss.” Out of nowhere???! Rick Ross, as usual, ponders the existential question of whether he can simultaneously be Big Meech and Larry Hoover. See below, if you can. Guess what’s projected on the floor beneath them? FIRE. The fire, in addition to being a worship symbol, also happens to be a metaphor implying that this is the most LIT segment of the night, featuring DJ Khaled (“All I Do Is Win”) and French Montana (“Stay Scheming”). By the time Usher and Nas appeared to duet their noble yet unknown song “Chains,” the crowd was at a standstill, lulled into numbness. Nas ended by yelling, “Don’t be no hypocrite!” How about also don’t be blind to what’s in front of you. Open your eyes. We’ll skip over Lil Wayne and Fabolous, whose performances were neither here nor there. We all know Jay Z is the headmaster of all this, so I’ll say, YES he threw up the Illuminati’s All Seeing Eye—excuse me, the Roc sign—after performing “Where I’m From,” “U Don’t Know,” blah blah. That’s six dancers. Six dancers. Six dancers. 6 6 6. Beyoncé finally entered the chambers to assist Nicki with “Feeling Myself,” in all pink and a dangerously whippable side-ponytail. It was like seeing two Delta sisters reunite and have a dual stroke. Okay. You might want to stand up for this. Watch Beyoncé’s left hand below. Yes, that was the triple-six sign she just threw up. Yes, she’s done it before. You can sit back down. Beyoncé later re-emerged with a black coat draped over her shoulders for “Holy Grail.” “This is my favorite song to sing with my husband,” she said, obviously lying, and making that song way more likable than it deserves to be. She appeared to be feeling the spirit. Bey whipping her ponytail while on her knees is the exact moment that the Illuminati forces combined and officially set in motion the next era of wealth and wellness. It was at that point that an unusual chill filled my entire body. I felt the change right then and there. Somewhere, Prince, who never even showed up, was watching and smiling. Let me now conclusively present to you The Handshake, which happened at exactly 10:52 p.m.